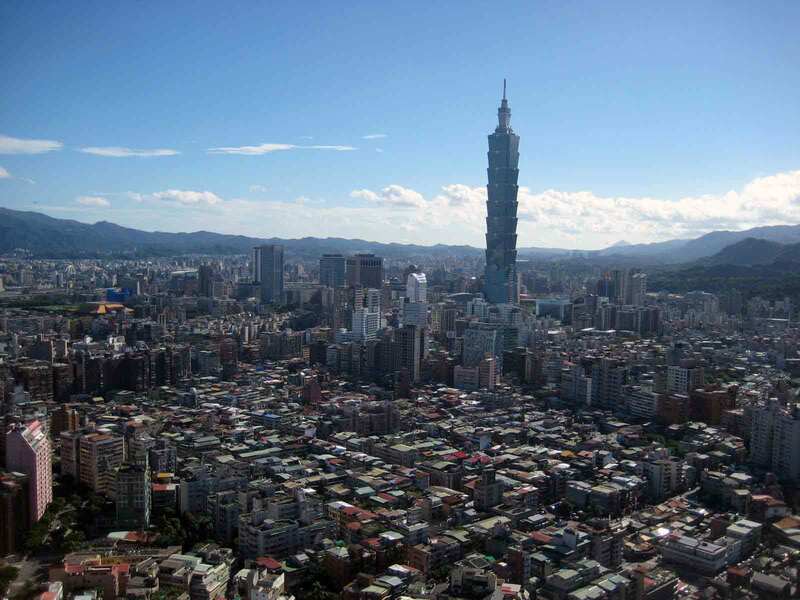 Population (October 2011 estimate): 7,728,400. Population growth rate (October 2011 estimate): 1.9%. 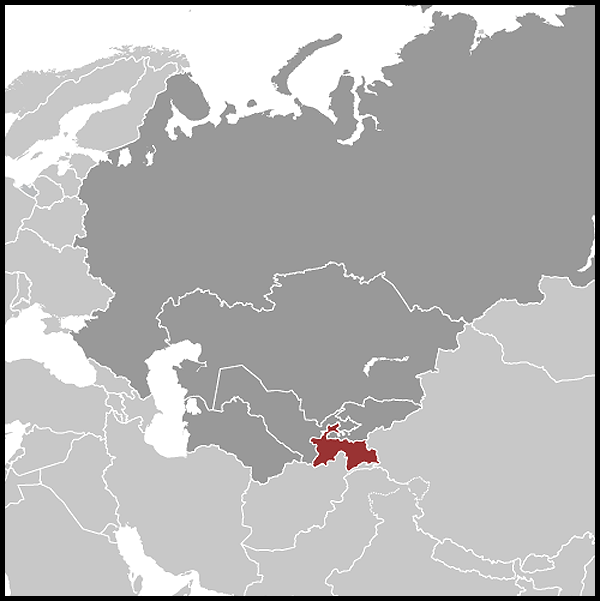 Language: Tajik (the official state language as of 1994, with follow-up legislation in 2009); Russian is widely used in government and business; 74% (est. 2010) of the population lives in rural communities where mostly Tajik is spoken. Education: Literacy: 98.4%. The Tajik education system has been struggling through a period of decline since independence, and some evidence suggests functional literacy is much lower. Health (2010 est. ): Life expectancy: 62.97 years men; 69.25 years women. Infant mortality rate — 38.54 deaths/1,000 live births. Branches: Executive: chief of state: President Emomali RAHMON since November 6, 1994; head of state and Supreme Assembly Chairman since November 19, 1992; head of government (appointed by the president): Prime Minister Oqil OQILOV since December 20, 1999; Oqilov has reached mandatory retirement age, but has not yet been replaced. Cabinet: Council of Ministers appointed by the president, approved by the Supreme Assembly. Elections: president elected by popular vote for a 7-year term; election last held November 6, 2006. Election results: Emomali RAHMON 79.3%, Olimjon BOBOYEV 6.2%, Amir QAROQULOV 5.3%, Ismoil TALBAKOV 5.1%, Abduhalim GHAFFOROV 2.8%. Legislative — bicameral Supreme Assembly or Majlisi Oli consists of the Assembly of Representatives or Majlisi Namoyandagon (lower chamber; 63 seats; members are elected by popular vote to serve 5-year terms) and the National Assembly or Majlisi Milli (upper chamber; 34 seats; members are indirectly elected by popular vote to serve 5-year terms, 25 selected by local deputies, 8 appointed by the president, plus former presidents of Tajikistan — currently there is one; all serve 5-year terms). Elections: last held February 28, 2010, for the Assembly of Representatives. Official election results: percent of vote by party — People's Democratic Party of Tajikistan 71.04%, Islamic Revival 8.20%, Communist Party 7.01%, other 13.75%. Judicial — Supreme Court; judges are appointed by the president. Political parties and leaders: People's Democratic Party of Tajikistan or PDPT [Emomali RAHMON]; Islamic Revival Party or IRPT [Muhiddin KABIRI]; Tajik Communist Party or CPT [Shodi SHABDOLOV]; Democratic Party or DPT [Maqsud Sobirov heads government-recognized faction; Mahmadruzi ISKANDAROV, currently serving 23-year prison term, is chairman of original DPT; Iskandarov's faction of DPT is headed by Rahmatullo VALIYEV]; National Social Democratic Party or NSDPT [Rahmatillo ZOYIROV]; Socialist Party of Tajikistan or SPT [Abduhalim GHAFFOROV; Murhuseyn NARZIEV heads the original SPT party that is currently unrecognized by the government]; Agrarian Party or APT [Amir QAROQULOV]; Party of Economic Reform or PERT [Olimjon BOBOYEV]. Defense (2010 est. ): Military manpower (availability) 1,980,000. Nominal GDP: $5.64 billion (2010); $6.3 billion (2011). Nominal per capita GDP (2010): $822. GDP real growth rate: 6.5% (2010); 7.4% (2011); 7% (2012 projection). Headline CPI inflation rate (end-of-year): 9.8% (2010); 13.6% (2011 projection); 10.0% (2012 projection). Official unemployment rate (2009, CIA World Factbook): 2.2% (2.6% reported by the State Statistics Agency in August 2011). The official rate is estimated based on the number of registered unemployment benefit recipients; it does not take into account the significant number of people who seek work abroad. Underemployment also is very high — possibly as high as 40% of the work force; 46.7% live below the poverty line according to the World Bank. Agriculture: Products: cotton, grain, fruits, grapes, vegetables; cattle, sheep, goats. Industry: Types: aluminum, gold, silver, antimony, zinc, lead, chemicals and fertilizers, cement, vegetable oil, textiles, metal-cutting machine tools, refrigerators and freezers. Trade (State Statistics Agency data): Exports (2011) — $1.2 billion: aluminum, electricity, raw cotton, cotton fiber, gold, fruits and vegetables, vegetable oil, textiles. Main export partners include Russia, China, Iran, and Turkey. Imports (2011) — $3.2 billion: electricity, petroleum products, aluminum oxide, machinery and equipment, foodstuffs. Import partners include Russia, China, Kazakhstan, Turkey, Uzbekistan, Azerbaijan, Ukraine, and Turkmenistan. Total public and publicly guaranteed external debt: $1.941 billion (2010); $2.124 billion (2011). Debt/GDP ratio: 33.4% (2010 est. ); 33.4% (2011). At 36'40' northern latitude and 41'14' eastern longitude, Tajikistan is located between Kyrgyzstan and Uzbekistan to the north and west, China to the east, and Afghanistan to the south. Tajikistan is home to some of the highest mountains in the world, including the Pamir and Alay ranges. Ninety-three percent of Tajikistan is mountainous with altitudes ranging from 984 feet to 24,589 feet, with nearly 50% of Tajikistan's territory above 10,000 feet. Earthquakes of varying degrees are frequent. The massive mountain ranges are cut by hundreds of canyons and gorges; at the bottom of these run streams which flow into larger river valleys where the majority of the country's population lives and works. The principal rivers of Central Asia, the Amu Darya and the Syr Darya, both flow through Tajikistan, fed by melting snow and glaciers in the mountains of Tajikistan and Kyrgyzstan. Flooding and landslides sometimes occur during the annual spring thaw. Contemporary Tajiks are the descendants of various ancient Iranian inhabitants of Central Asia, in particular the Soghdians and the Bactrians, and possibly other groups, with an admixture of Mongols and Turkic peoples. The largely Shi'a inhabitants of the Pamir mountains speak a number of mutually unintelligible eastern Iranian dialects quite distinct from the Tajik spoken in the rest of the country. Until the 20th century, people in the region tended to identify themselves more by way of life — nomadic versus sedentary — and place of residence than by ethnic group. The distinction between ethnic Tajiks and Uzbeks was not always precise, and people in the region often used — and continue to use — each other's languages. The Soviets tended to reify ethnicity, and drew Central Asian republican boundaries so that they balanced ethnic representation in fertile areas such as the Ferghana Valley while also making large-scale ethnic mobilization difficult. The current Tajik Republic hearkens back to the Samanid Empire (A.D. 875-999), which ruled what is now Tajikistan as well as territory to the south and west, as its role model and name for its currency. During their reign, the Samanids supported the revival of the written Persian language in the wake of the Arab Islamic conquest in the early 8th century and played an important role in preserving the culture of the pre-Islamic Persian-speaking world. They were the last Persian-speaking empire to rule Central Asia. The expanding Russian Empire encompassed the territory that is now Tajikistan, along with most of the rest of Central Asia, during the late 19th and early 20th centuries. Russian rule collapsed briefly after the Russian Revolution of 1917, as the Bolsheviks consolidated their power and were embroiled in a civil war in other regions of the former Russian Empire. As the Bolsheviks attempted to regain Central Asia in the 1920s, an indigenous Central Asian resistance movement based in the Ferghana Valley, the "Basmachi movement," resisted but was largely eliminated by 1925. Tajikistan became fully established under Soviet control with the creation of Tajikistan as an autonomous Soviet socialist republic within Uzbekistan in 1924, and as an independent Soviet socialist republic in 1929. The northern Sughd region, previously part of the Uzbek republic, was added to the Tajik republic at this time. In June 2003, Tajikistan held a flawed referendum to enact a package of constitutional changes, including a provision to allow President Rahmon the possibility of re-election to up to two additional 7-year terms after his term expired in 2006. Tajikistan's 2006 presidential election and 2010 parliamentary elections were considered to be flawed and unfair but peaceful. President Rahmon secured a new 7-year term in the November 6, 2006 election. The Organization for Security and Cooperation in Europe's Office for Democratic Institutions and Human Rights (ODIHR) determined that democratic practices were not fully tested "due to the absence of genuine competition, which provided voters with only nominal choices." There were four other candidates on the ballot but no strong opposition candidate. The strongest opposition party, the IRPT, decided not to field a candidate and two other parties (the DPT and SDPT) boycotted the presidential election. The ruling party secured 55 of the 63 seats in the 2010 parliamentary elections, which failed to meet many key ODIHR standards on democratic elections. Some observers saw them as even worse than the flawed 2005 parliamentary elections. Tajikistan established an embassy in Washington, DC in temporary offices in February 2003, and formally opened its first permanent chancery building in March 2004. Tajikistan's embassy (http://www.tjus.org/) in the United States is at 1005 New Hampshire Ave NW, Washington, DC 20037 (tel. : 202-223-6090; fax: 202-223-6091). Tajikistan is the poorest Commonwealth of Independent States (CIS) country and one of the poorest countries in the world. Foreign revenue is precariously dependent upon exports of cotton and aluminum and on remittances from Tajik migrant workers abroad, mainly in Russia. The economy is highly vulnerable to external shocks. Despite this, Tajikistan managed modest growth during the height of the recent economic crisis, and growth picked up again in 2010 (6.5%) and 2011 (7.4%). Tajikistan has great hydropower potential and has focused on attracting investment for projects for internal use and electricity exports. Meanwhile, the country faces severe electricity shortages, particularly during the winter and beyond, when most of Tajikistan's inhabitants receive little or no electricity for weeks at a time. The government sees the construction of the massive Roghun hydroelectric dam as the solution to the country's chronic energy woes, but the dam has been a source of increasing friction with Uzbekistan. Tajikistan has followed a relatively strict fiscal and monetary policy, which has resulted in macroeconomic stability. However, government interference in the economy and massive corruption stifle economic growth and private investment. The government has attracted state-led investment for major infrastructure projects, particularly from China, rather than implementing the necessary economic reforms to attract private investors. Two-thirds of the workforce of Tajikistan is in agriculture, where wages are abysmally low and sometimes non-existent. Tajikistan struggles to implement agricultural reforms that would allow many farmers to grow the crop of their choice, rather than being forced to grow cotton, as has been the practice from Soviet times. Income from narcotics trafficking, while difficult to quantify, has an increasingly visible impact on the Tajik economy. Afghanistan continues to represent the primary security concern in Tajikistan's immediate neighborhood, although 2010 violence in Kyrgyzstan caused concern. With the ouster of the former Taliban government from Afghanistan, Tajikistan now has much friendlier relations with its neighbor to the south. The Taliban-allied Islamic Movement of Uzbekistan (IMU), a U.S. Government-declared terrorist organization formerly active in Afghanistan and Tajikistan, has also been greatly diminished as a threat to Tajikistan's domestic stability. Rampant illicit trafficking of Afghan opium and heroin through Tajikistan remains a serious long-term threat to Tajikistan's stability and development, fostering corruption, violent crime, and economic distortions. Tajikistan has a difficult relationship with Uzbekistan. Uzbekistan is concerned about Tajikistan's plans to develop hydropower, which Uzbekistan views as a threat to downstream irrigation. Border disagreements arise sporadically between Tajikistan and Uzbekistan and the Kyrgyz Republic. For the most part these are minor disagreements concerning people moving across mostly unmarked borders, but occasionally disputes develop into situations where gunfire is exchanged. For the most part relations are strained but peaceful. The United States remains committed to assisting Tajikistan in its economic and political development, as Tajikistan continues to recover from its civil war legacy. U.S. assistance efforts are evolving away from humanitarian aid and political reconciliation, as those needs increasingly have been met. Instead, U.S. efforts are targeted toward broader goals of democratic, social sector, and economic reform. U.S.-Tajik relations have developed considerably since September 11, 2001. The two countries now have a broad-based relationship, cooperating in such areas as counter-narcotics, counterterrorism, non-proliferation, and regional growth and stability. 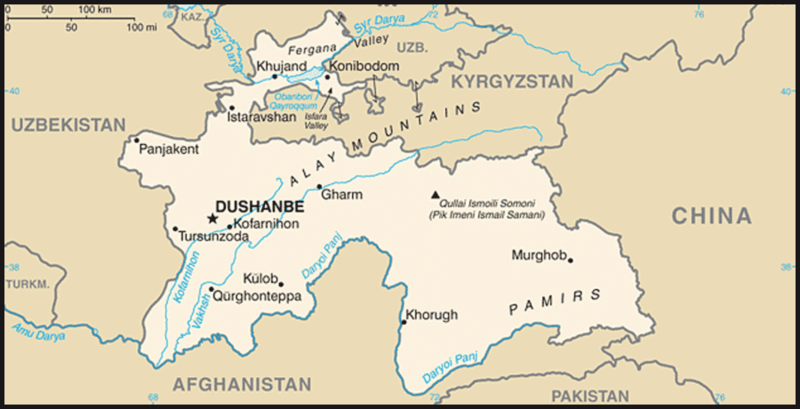 In light of the Russian border forces' withdrawal from the Tajik-Afghan border, the U.S. Government leads an international donor effort to enhance Tajikistan's territorial integrity; prevent the transit of narcotics and material or technology related to weapons of mass destruction (WMD); and support a stable, peaceful Tajikistan in order to prevent the spread of influence and activities of radical groups and terrorists. In February 2010, the U.S. and Tajikistan launched an annual bilateral consultation process to enhance cooperation on a broad range of policy and assistance issues. The U.S. continues to assist Tajikistan on economic reforms and integration into the broader global marketplace, for example in pursuing World Trade Organization (WTO) accession. U.S. assistance also supports health and education, as well as democracy, media, and local governance. Tajikistan has been a strong supporter of U.S. efforts on counterterrorism and in promoting peace and stability in Afghanistan. A U.S. Government-funded $36 million bridge over the Amu Darya River connecting Sher Khan, Afghanistan with Nizhniy Pyanzh, Tajikistan opened for commercial traffic in October 2007 and about 200 trucks cross daily. Since the opening, trade volume has more than tripled. The bridge and related customs facilities will continue to enhance economic and commercial opportunities on both sides of the river, allowing goods and people to move across more easily. On the Afghan side, the bridge road will connect to the Afghan Ring Road. The U.S. Export-Import Bank and JP Morgan guaranteed and funded a $182 million purchase of Boeing 737-900ER airliners for the private Tajik airline company "Somon Air." The United States recognized Tajikistan on December 25, 1991, the day the U.S.S.R. dissolved, and opened a temporary embassy in a hotel in the capital, Dushanbe, in March 1992. After the bombings of U.S. embassies in Africa in 1998, Embassy Dushanbe American personnel were temporarily relocated to Almaty, Kazakhstan, due to heightened Embassy security standards. American Embassy Dushanbe has since returned to full operations and in July 2006 moved into a purpose-built embassy compound.